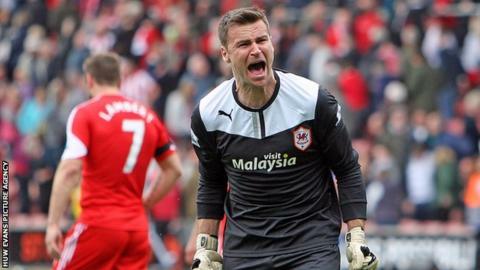 Former England goalkeeper Peter Shilton says David Marshall's performances this season could be enough to keep Cardiff City in the Premier League. Marshall has earned rave reviews for his displays even though Cardiff are currently in the bottom three. And Shilton, England's most capped player with 125 appearances, says the Scotsman is key to Cardiff's survival. "He's going to play a big part in Cardiff staying up," said Shilton. "When you're at the bottom of the league it's a lot harder for a keeper than when you are in a side doing well," Shilton said. "[David] Marshall's had a great season and let's just see what happens between now and the end of the season because he's going to play a big part." "Marshall's had a great season and let's just see what happens between now and the end of the season because he's going to play a big part." Marshall gave another fine display as Cardiff won 1-0 at Southampton to boost their hopes of escaping the drop. The Bluebirds have four matches remaining, starting with the visit of Stoke City on 19 April. Team-mate Kevin McNaughton has hailed Marshall's performances this season.